What Day Of The Week Is June 24? 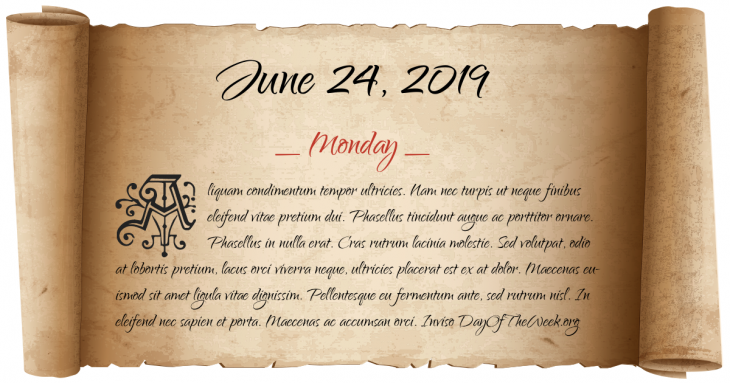 June 24, 2019 is the 175th day of the year 2019 in the Gregorian calendar. There are 190 days remaining until the end of the year. The day of the week is Monday. Hundred Years’ War: Battle of Sluys – The French fleet is almost destroyed by the English Fleet commanded in person by King Edward III. Henry VIII and Catherine of Aragon are crowned King and Queen of England. Battle of Macau: The Dutch attempt but fail to capture Macau. Battle of Custoza: an Austrian army defeats the Italian army during the Austro-Prussian War. Greece and Serbia annul their alliance with Bulgaria. The United Kingdom grants Zanzibar internal self-government. The Humber Bridge is opened to traffic, connecting Yorkshire and Lincolnshire. It would be the world’s longest single-span suspension bridge for 17 years. The Igandu train disaster in Tanzania kills 281, the worst train accident in African history. Who were born on June 24?